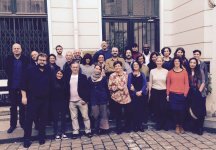 Representatives from 6 European collectives (Germany, Spain, Italy, Poland, Russia and Switzerland) will meet in Paris, at the invitation of the International Committee of independent publishers (ICIP). The main objectives of this meeting are to share knowledge, discuss business issues, plan partnerships, and build the foundations for future exchanges. This is only the first step towards strengthening an independent publishing open to the world, and guaranteeing bibliodiversity. A part of this meeting will focus on the governance of the Alliance, as well as an assessment of the Bibliodiversity Observatory, some few months after its creation in July 2016. Click here to consult programme and participants list !